Why then do these agreeable avians sometimes ditch the collaborative lifestyle and instead deposit eggs into nests outside the communal group, acting like social parasites, in the hopes that other females will raise the chicks as their own? In a paper published online in the journal Nature, Princeton researchers show that the cuckoos, known as greater anis (Crotophaga major), act collectively for the most part but can become social parasites after their communal nest is destroyed. 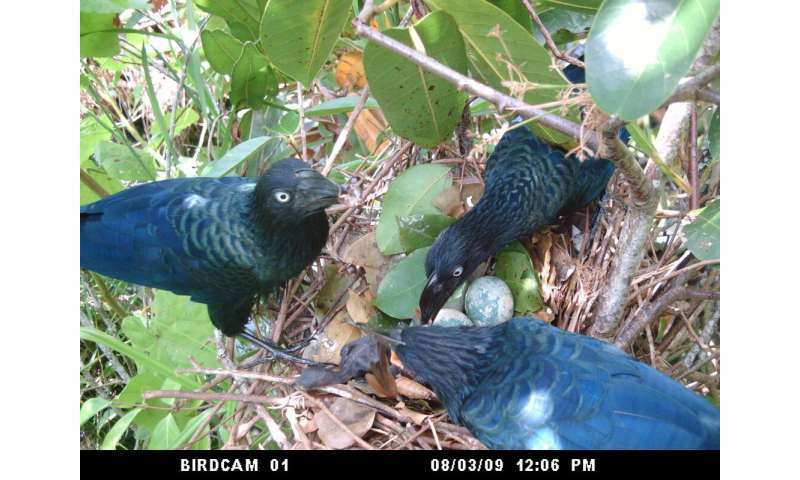 They start the breeding season placing all their eggs in one basket, but if predators intervene, the birds switch to a strategy of spreading the eggs around in other nests. "When different females in a population pursue different reproductive tactics, like cooperative and parasitic nesting, this poses an evolutionary puzzle. We wondered why some females lay their eggs into other groups' nests, whereas other females never do," said Christina Riehl, assistant professor of ecology and evolutionary biology. She and co-author Meghan Strong, a research specialist in the Department of Ecology and Evolutionary Biology, conducted the study with help from undergraduates, graduate students and interns, including several from the Princeton Environmental Institute (PEI). "We found the parasitic strategy is more of a second-line option," Riehl said. "It's as if the birds say, 'If our cooperative attempt fails, let's go to Option B.'" The team concluded that the two reproductive strategies can coexist in the population because the mixed strategy of first cooperating and then parasitizing yields about the same number of offspring as the pure cooperative strategy does. If one or the other were clearly better, then all the birds would most likely adopt the most successful strategy. The greater ani is one of the few bird species in which unrelated females come together to raise their young communally. In contrast, social parasitism is quite common, found in over 250 bird species. To find out why the normally collaborative anis resort to parasitism, the scientists observed the birds and their nesting behaviors over an 11-year period at Barro Colorado Nature Monument in Panama. The birds build the nests in branches that overhang the Panama Canal, requiring the researchers to reach the nests by boat. Under constant threat from predators such as snakes and monkeys, nearly all of the anis start the breeding season in communal groups, the researchers found. 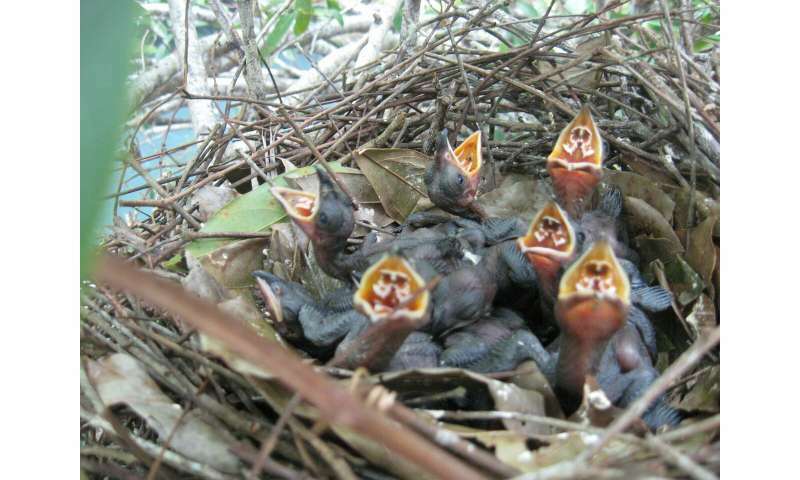 However, social parasitism is also widespread, the researchers found, with about 25 percent of the nests being parasitized by a female who was not a member of the group. The team found that females whose nests were destroyed by predators early in the nesting cycle were most likely to lay parasitically, typically in nests close to their own failed nest. The researchers also asked whether switching mid-season from collective nesting to social parasitism might actually lead to more offspring. Although laying as many eggs as possible sounds like a good strategy, social parasitism has drawbacks. The eggs tend to be slightly smaller and thus less likely to thrive. And due to the risk of being found out, these eggs have a lower chance of survival to the stage where the chicks leave the nest. In contrast, the cooperative females lay fewer eggs but they put more effort into tending them, so more chicks survive to leave the nest. The take-away: Both of the reproductive strategies—communal breeding only versus the mixed approach of starting as communal breeders and switching to parasitism—are viable reproductive strategies. Mark Hauber is an ornithologist and behavioral ecologist of the University of Illinois at Urbana-Champaign who was not involved in the study. "The study explains why cooperative breeding is maintained evolutionarily in this species—solitary breeding or parasitism alone are simply not productive enough," Hauber said. "But either cooperative breeding with large clutches or failed cooperative breeding followed by parasitism are equivalent strategies fitness-wise. Thus parasitism continues to be present in the population and so is cooperative breeding." The team also found that the same females turned to parasitism after the failure of their nests year after year. "Previously in my own work on captive zebra finches I found that some individuals are more likely to become brood parasites than others," Hauber said. "This is now demonstrated and confirmed firmly in a wild population of free-living tropical birds." The ongoing study monitors roughly 40 to 60 nests per year. Overall, for the current finding, the team studied genetic data from 1,776 eggs laid by 210 females in 240 nests from 2007-17. Each year the team begins the breeding season in June by searching for nests in the vegetation along the shoreline. The researchers check the nests daily, swabbing each new egg to collect cells and blood left on the egg with the goal of using genetics to identify each egg's mother. They weigh and measure every egg, and collect blood from the chicks to confirm their parentage. "Getting into the nest is actually often the trickiest part of collecting measurements," said Luke Carabbia, Class of 2019, who conducted field work as a PEI intern. "While some groups of birds cooperate with us very well and nest right at an accessible chest height, others build their nests all the way at the top of their trees or in flimsy reeds deep in grass, and the birds often have a real knack for picking spots that are either incredibly thorny or right next to a nest of angry wasps."